This card gains corresponding effects if you Normal Summon it by Tributing these monsters. :- Green Gadget: This card gains 300 ATK. :- Red Gadget: When this card inflicts battle damage to your oppone.. If this card attacks, your opponent cannot activate any Spell/Trap Cards until the end of the Damage Step. This card gains corresponding effects if you Normal Summon it by Tributing these monsters. :-..
2 Level 4 Machine-Type monsters. Once per turn: You can detach 1 Xyz Material from this card; add 1 Level 4 or lower Machine-Type monster from your Deck or Graveyard to your hand. When this card leave.. 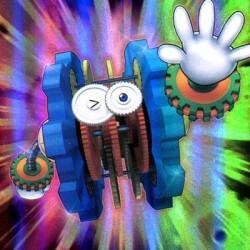 If you control a "Geargia" monster, you can Special Summon this card (from your hand) in Defense Position. When this card is sent from the field to the Graveyard: You can target 1 "Geargia" monster in..
3 Level 3 monsters. During either player's Battle Step, while an attack involving your Machine-Type monster is occurring: You can detach 1 Xyz Material from this card; negate the effects of all face-u.. When this card is Special Summoned by the effect of a "Geargia" card: You can Special Summon 1 "Geargia" monster from your hand or Graveyard in Defense Position, except "Geargiano Mk-III", but its eff..
Once per turn: You can change this card to face-down Defense Position. When this card is flipped face-up: You can destroy any number of Spell/Trap Cards on the field, up to the number of other "Geargi.. Both players can Normal Summon "Ancient Gear" monsters with 1 less Tribute. When this card is destroyed and sent to the Graveyard: You can Special Summon 1 "Ancient Gear" monster from your hand, Deck,..
Once per turn, you can either: Target 1 Machine-Type monster you control, equip this card to that target, OR: Unequip this card and Special Summon it in Attack Position. While equipped by this effect,.. When this card is Normal Summoned: You can increase the Levels of all Machine-Type monsters you currently control by 1. If this card attacks a Defense Position monster, inflict piercing battle damage ..
All Machine-Type monsters on the field gain 200 ATK. Each time a face-up Machine-Type monster(s) on the field is destroyed by battle or card effect, place 2 Junk Counters on this card. You can send th..